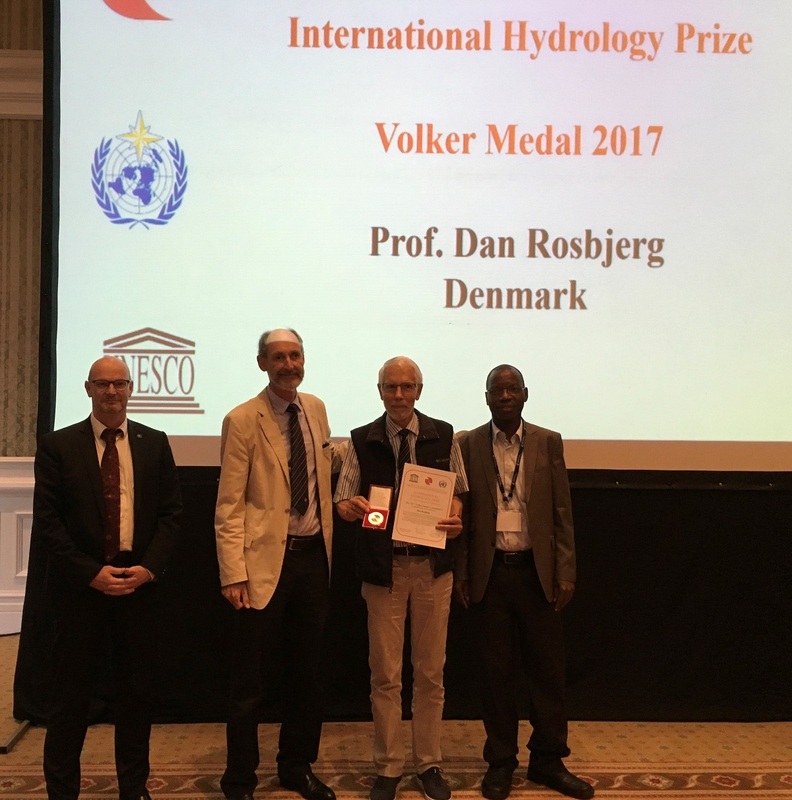 The Volker medal of the 2017 International Hydrology Prize of IAHS/WMO/UNESCO goes to Professor Dan Rosbjerg. "For outstanding scientific achievements in Hydrology and Water Resources, his life-long dedication and service to IAHS, and his contributions to the International Hydrological Programme of UNESCO". Dan Rosbjerg has been an active hydrological scientist since 1970. His first relations to IAHS were a journal paper in 1970 and a red book paper in 1973. Throughout his long international standing, Dan Rosbjerg has contributed significantly to the development and testing of extreme value theory and flood frequency analysis, starting out with a PhD thesis in 1973 on risk evaluation of a natural flood control reservoir. In 1993, his work on the partial duration series approach in extreme value statistics came together in his habilitation dissertation “Partial Duration Series in Water Resources”, which became a major inspiration for younger hydrologists. Water resources management has been a subject of particular interest throughout his career. In the 1990s, Dan Rosbjerg headed The Groundwater Research Centre of Denmark. The Centre was internationally renowned and undertook timely research on contaminant transport, landfill remediation, pesticide degradation, multiphase flow, preferential transport and groundwater recharge. Besides having the overall responsibility, Dan Rosbjerg contributed in particular to the development of inverse modelling. The Red Book no. 251 on “Sustainable Reservoir Development and Management”, published in 1998 was an important milestone. Recently, a gradually increasing emphasis is laid on climate-related research. Due to increasing temperature and growing intensity of cloudbursts, new guidelines for urban drainage became necessary. Dan Rosbjerg has been active in revisions of national guidelines and in research on application of downscaling products with emphasis on extreme rainfall predictions and related uncertainty assessments. Recommendations for application of climate factors in design are now available as well as guidelines on how to minimise the impacts of pluvial flooding. Dan Rosbjerg attended the First IAHS Scientific Assembly in Exeter in 1982, and since then he has taken part in all following IAHS and IUGG assemblies, in total 18 in a row, perhaps close to a record. In addition, outside the assemblies, he has attended a long series of IAHS conferences and workshops. The close involvement in IAHS began after the Vancouver assembly in 1987, where he entered the newly formed International Committee on Atmosphere-Soil-Vegetation Relations. Four years later, in 1991, he was elected vice-president of the International Commission on Water Resources Systems (ICWRS), a position he held for 8 years. In 1999, he became president-elect of ICWRS leading to the presidency 2001-2005 and the position as past president 2005-2007. During 2007-11, he held the position as vice-president of IAHS. Altogether he served as an IAHS-officer for 24 years in succession, again perhaps a record. Dan received many outstanding honours, among which, in 2001, the Henry Darcy Medal of the European Geosciences Union (EGU) in recognition of outstanding contributions to the analysis of extreme hydrological processes and their engineering implications. During 1996-2009, Dan Rosbjerg served as Danish delegate to the Intergovernmental Council of the International Hydrological Programme of UNESCO, where he chaired the ad-hoc Governance Committee of IHP during 2002-2004. Dan also had an impressive career as a scientific editor. During the period 1991-2014, he was editor of 12 red books. In this capacity, he put a great effort in helping authors from developing countries to upgrade their papers with respect to language and structure, provided a sufficient scientific quality of their work. For 25 years, 1986-2011, Dan Rosbjerg served as editor of Nordic Hydrology with the ambition to strengthen its international profile. These efforts finally reached a maximum when the British Hydrological Society in 2008 decided that Hydrology Research should become their official journal. A few years later, the German Hydrological Society and the Italian Hydrological Society joined as well. He has been member of editorial boards for Stochastic Hydrology and Hydraulics, Extremes and Journal of Hydroinformatics. In 2009, he received the Top Referee Award from Journal of Hydrology in recognition of outstanding contributions to the journal. In view of his exceptional scientific achievements, his dedicated contributions and wide-ranging services to the benefit of IAHS, IHP-UNESCO and other hydrologic communities, and his high ambitions and successful efforts to strengthen the international profile of regional hydrological scientific publication initiatives, it is my great pleasure and honour to award the 2017 Volker medal to Prof Dan Rosbjerg. I would like to thank Eva Boegh and het 15 co-nominating National Representatives for their excellent nomination and on behalf of IAHS, WMO, UNESCO and the entire hydrological community, I would like to congratulate Dan Rosjberg with receiving the 2017 Volker medal. 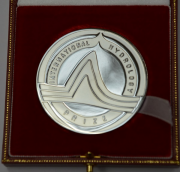 Let me start by thanking IAHS, UNESCO and WMO for awarding me the International Hydrology Prize, the Volker medal. Actually, I remember Volker from several meetings in the past, always observant and sitting in the first row in the audience. This year he would have been 100 years old. My special thanks to the initiators of the nomination Andreas Schumann and Eva Bøgh, the last mentioned also for writing the nomination letter and collecting support. Also of course my sincere thanks to the many supporters. I have enjoyed a long journey with hydrology, but this was definitely not planned from the beginning. As a master student I specialized in hydrodynamics; hydrology was not at all on the course program. However, when I finished in early 1969 I was asked to join the institute as research assistant supporting Carl Nordin from USGS, who was invited to Denmark to introduce hydrology as a university subject. In the spring he taught physical hydrology, while the fall was planned for stochastic hydrology. However, during the summer break he got seriously ill and could not teach. Then, despite my sparse hydrological background, I was asked to step in, and here I picked up a life-long affinity for the stochastic aspects of hydrology. At the end of the year he recovered, and in 1970 we published a paper in Bulletin of the International Association of Scientific Hydrology, the predecessor of Hydrological Sciences Journal, my first contact with IAHS. My next contact was a red book paper in 1973, but it was not before 1982 it got momentum. The reason was the First Scientific Assembly of IAHS in Exeter. It was a fantastic meeting, two full weeks plus a one week post-conference tour. I felt really welcomed and met many colleagues, who I benefitted from in my further career, among them Vit Klemes, who later became the president of IAHS. He was extremely polite and helpful, but at some later meetings he also asked some tough questions, in particular on flood frequency methods. When we had breakfast together, I was cross-examined. Later, when I became head of a centre of excellence in groundwater, he enjoyed receiving our annual reports, and in the end I think he realized he had been too tough on stochasticity. Having mentioned Exeter, I could continue: Hamburg, Budapest, Vancouver, Baltimore, Vienna, Yokohama, Boulder, Rabat, Birmingham, Maastricht, Sapporo, Foz do Iguacu, Perugia, Hyderabad, Melbourne, Gothenburg, Prague, and now Port Elizabeth. I have attended them all, 19 in a row, besides several IAHS workshops in between. To contribute to these meetings - and Nordic, AGU and EGU meetings as well - has been an invaluable inspiration for my hydrological work. It has been a privilege for me to take part in the commissions and the bureau of IAHS for many years. Of course it can be hard to convene meetings and edit red books, but in the end I have always found it more rewarding than bothersome. In addition, it has given me the opportunity to work together with prominent hydrologists and establish deep friendships. Let me just mention a few of the most close collaborators. From ICWRS: Initially Kuniyoshi Takeuchi, Zbyszek Kundzewicz, Xia Jun, and Slobodan Simonovic, then later on Andreas Schumann, Günter Blöschl , Hubert Savenije and Alberto Montanari, and from the bureau of IAHS: Pierre Hubert, Arthur Askew, Gordon Young and Christophe Cuddenec. Let me turn to UNESCO-IHP. During 15 years I was the Danish delegate to IHP and part of that time I was also member of the council. As such I felt that I should contribute more than just taking part in the debating, and in the division of duties I volunteered for the Ad hoc Governance Committee that was established to solve more than 10 years of severe disagreement in the council. I was serving first two years as vice-chair and then two years as chair. It turned out to be the most difficult task I have ever undertaken. Fortunately, after years of strong dissent and fighting, it all ended up with a unanimous decision. In the final session of one of the meetings in the IHP council all invited associations should address the council. However, the Secretary General of IAHS had been forced to leave the meeting in the morning apparently being unable to send a substitution. As I realised that this could be embarrassing for IAHS, I just took the floor and improvised an address. John Rodda was there but representing WMO, thus being unable to speak for IAHS. After the session he caught me and said that I really should deserve the International Hydrology Prize for saving the reputation of IAHS. Of course it was a joke, but strange enough his prophesy came true, and here I am. I have enjoyed travelling around in the hydrological cycle for almost 50 years: surface water, groundwater, soil and atmosphere, precipitation, climate and water resources management. It has been an unforgettable journey. I would like to extend my thanks to all friends in the community not particularly mentioned above excusing for not including their names. However, before ending I must add two more names. Among my previous PhD students I particularly acknowledge two of them for their excellence and for contributing extremely much to my career, Peter Rasmussen who sadly passed away early this year, and Henrik Madsen who still is a very close collaborator. Finally, a deep gratitude is given to my wife Kirsten and our four children for their love and support.